Well, a little more maybe and to be really precise a little bit of Essex and Cambridgeshire too! Yes, we’ve moved sites and our second week sees us at Roseberry Tourist Park in the village of Willingham a few miles north of Cambridge. It’s a lovely site, nice and open which means that TV and mobile reception is good. It also means that we kop the full force of the winds currently howling across the fens. Poor old Patsy is currently getting buffeted in a way we’ve not seen since our first outing in her – to Wiltshire – in February. 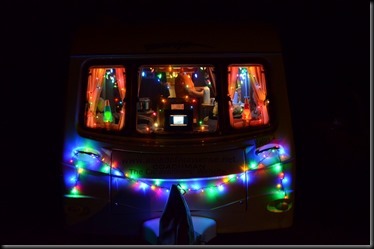 This is the ‘friends & family’ leg of the trip and has become a festive tradition – well, we done it last year anyway. Christmas Day and a fair percentage of the rest – will be spent with Trev’s Mum, AKA HRH but if time allows we hope to catch up with some old – and some not so old – friends too. Regulars & friends will know that Cambridge was our place of birth and home town for many years. Right, enough of that and back to the matter in hand. 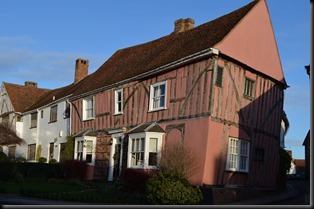 With the last blog completed somewhere around lunchtime, Tuesday afternoon saw us first in Lavenham, another picture postcard Suffolk village – that is if you could take all the cars away, although it’s hardly unique in that respect. 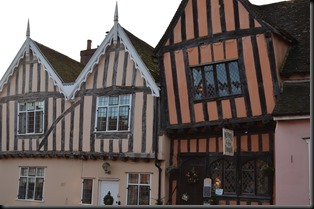 That usual gripe aside it is very pretty – and Lavenham’s crooked medieval cottages with exposed timbers have been seen in a number of films and TV programmes too. The last episode of ‘ Lovejoy’ with Ian McShane was film here, as was scenes from a couple of the Harry Potter films – amongst others. One of the disadvantages of sightseeing in winter is the light – or lack of it. The sun was already going into hiding when we descended upon Hadleigh for a quick look around. 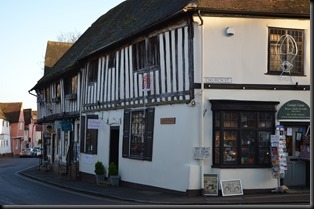 A quick pint – purely for medicinal purposes – was the sum total of our contribution to Hadleigh’s economy before we headed back to base via Long Melford for our regular pre-dinner libation. 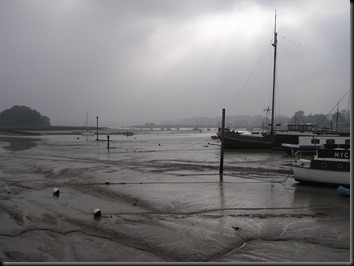 Wednesday, and after another late start we headed south and over the border into Essex and the town of Halstead. We’d been though it enough times when visiting Trev’s late sister and brother-in-law in Haverhill and wanted a change from the monotony and/or traffic of the M11. A pleasant enough place but the number of empty shops suggested it had been hit pretty hard by the downturn. Keen X-Factor watchers – but probably very few others – will know that 2010 winner Matt Cardle is a resident. Heading back we stopped at Clare for a stretch and a chippy and paused again further along the A1092 at Cavendish. 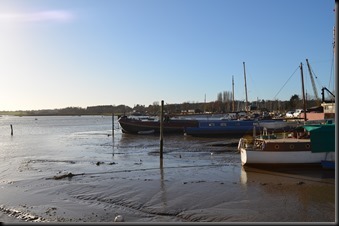 Another pretty Suffolk village, Cavendish was where Sue Ryder – having established the Sue Ryder Foundation – opened her first care home – initially for concentration camp survivors. Her legacy is immense, although sadly she was less than enlightened when it came to homosexuality. As a life peer in the House of Lords she wanted to make it illegal for us lot to have care or custody of a child under eighteen. Charming. 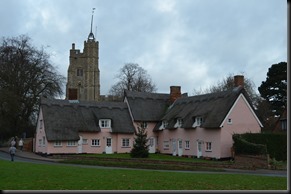 She is buried in Cavendish with her husband – one Leonard Cheshire, also well known for his charitable work. We met up with the farm and site owner Odell in the evening for an enjoyable chinwag in the nearby Swan. 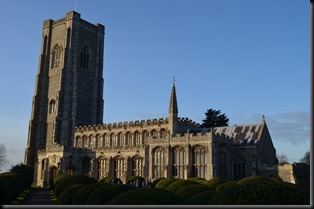 An even later start Thursday saw us back in Bury St Edmunds. The original plan had been to go to the cinema late afternoon then get a meal out somewhere but it wouldn’t have been fair to inflict my continuing coughing fits on the other customers, so we gave it a miss and had another stroll around town instead procuring some more cheap Christmas lights for Patsy who is now looking very festive indeed. It was a lot brighter this time as you can see! After Woodbridge, Ipswich was next. A gentle meander around the shops was planned but we arrived rather later than intended and by the time we’d negotiated a very busy ring road and found a parking space time was marching on. Not only that but a caffeine fix was long overdue and I was wilting from the contestant hacking coughing, so having picked up what we needed we headed back to the car and off towards the A12. Our final stop of the day was Colchester- not for sightseeing or shopping but to meet up with my cousin Andy and his wife Janet who’d invited us over for a meal. It was good to catch up again, having not seen them since Twittercamp in October. 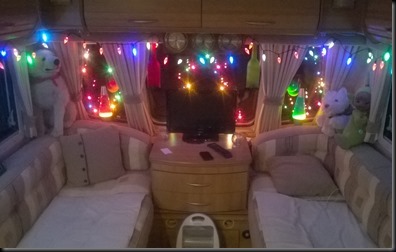 We’ve not seen much of each other over the years – apart from the inevitable family funerals – but we’re now in regular contact thanks in no small part to our love of caravanning and have met up more times in the last couple of years than in the last twenty. Not only that but Janet is a damn fine cook and the meal was excellent. Andy’s generosity with the scotch after dinner ensured that my cough subsided for a little while – fortunately Trev was driving! It was a very enjoyably evening. So, our time in Suffolk at Brighthouse Farm was at an end. Saturday morning saw us haul Patsy 50 or so miles along the delightful A14 to Cambridgeshire where we’ll be for a week. So, have a good Christmas and look out for another blog in a week or so. Cheers!